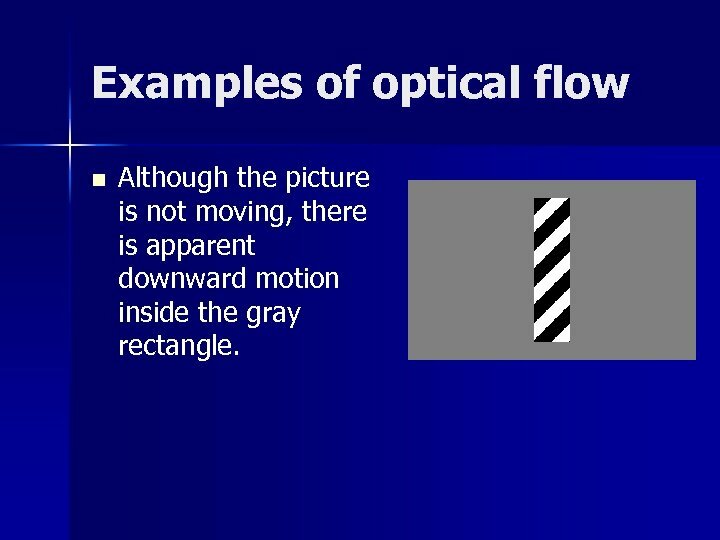 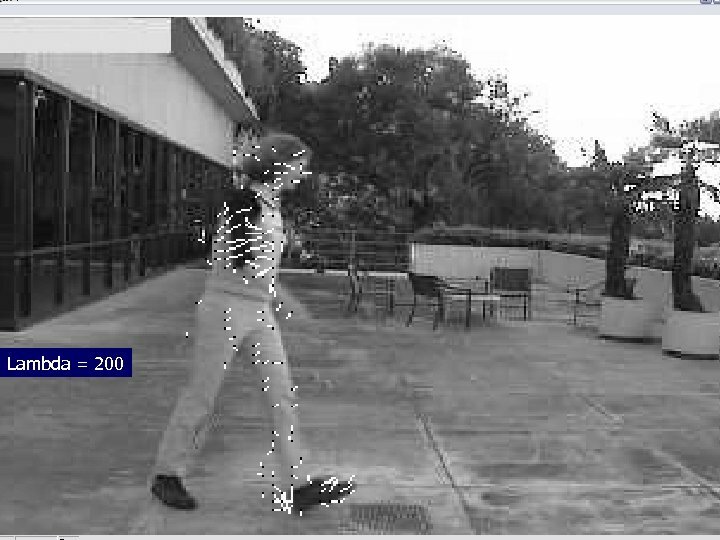 Examples of optical flow n Although the picture is not moving, there is apparent downward motion inside the gray rectangle. 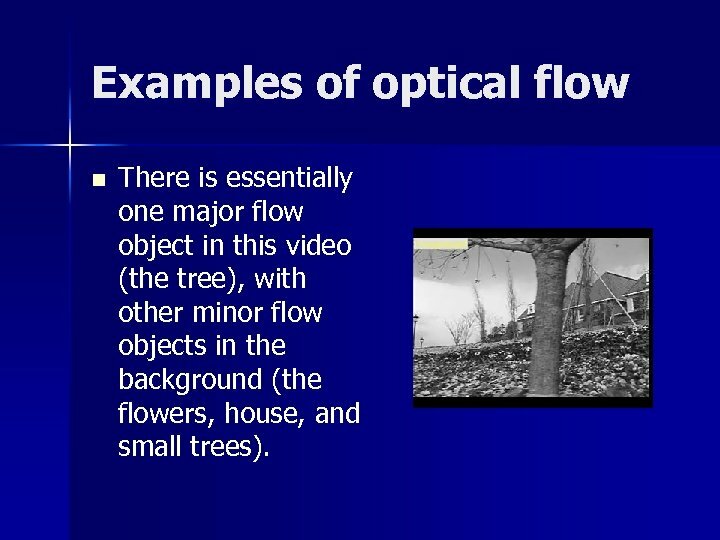 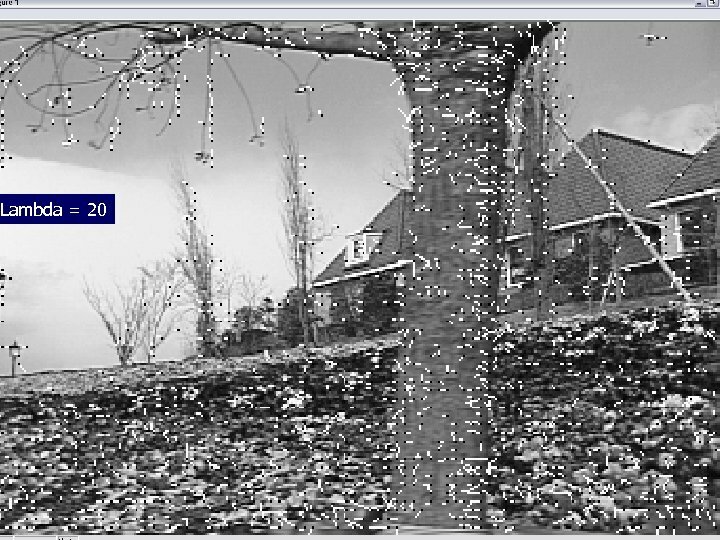 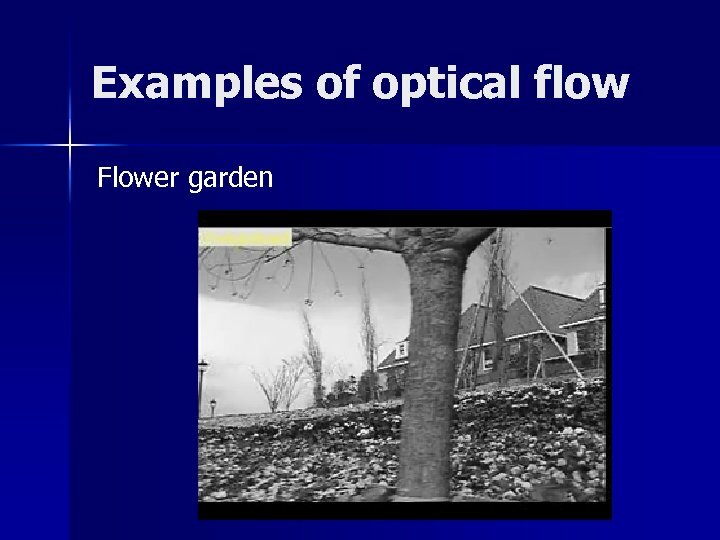 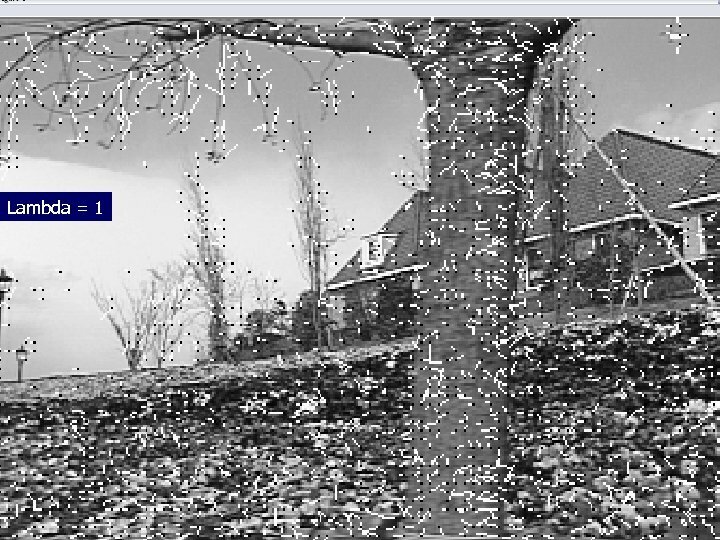 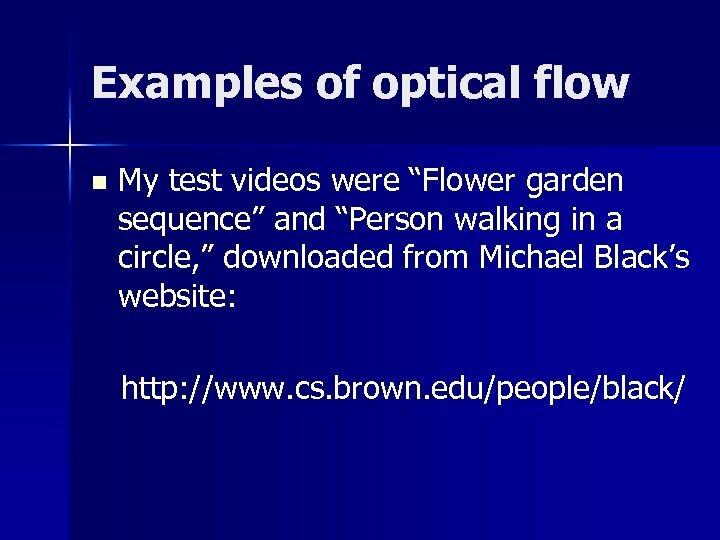 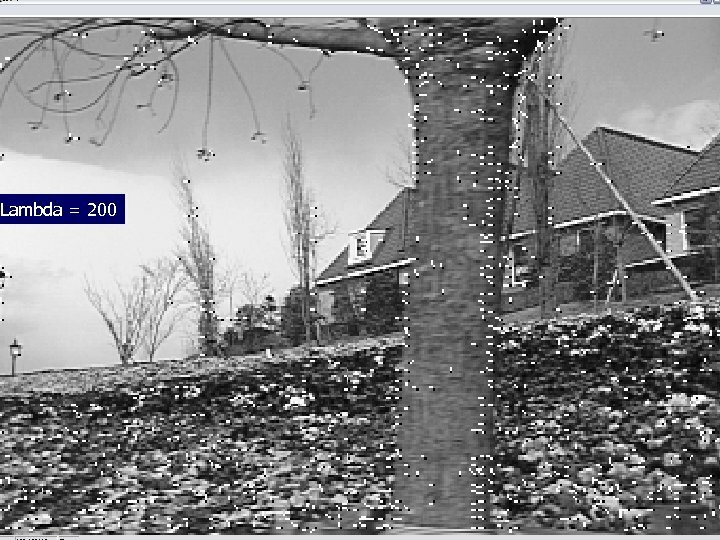 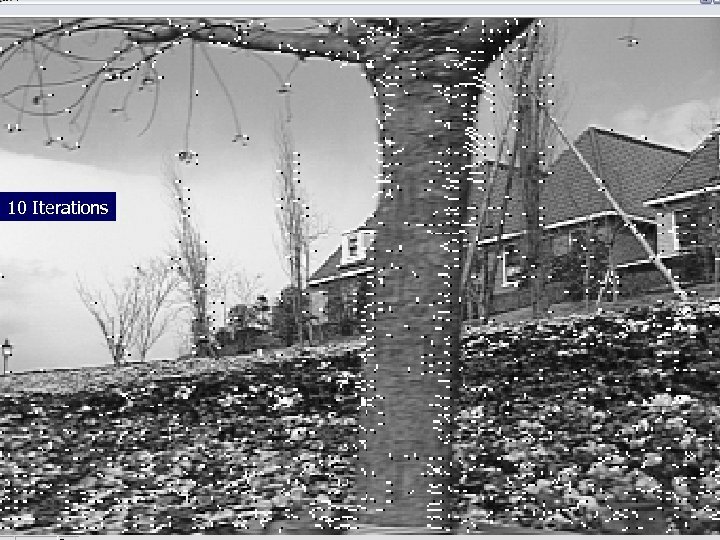 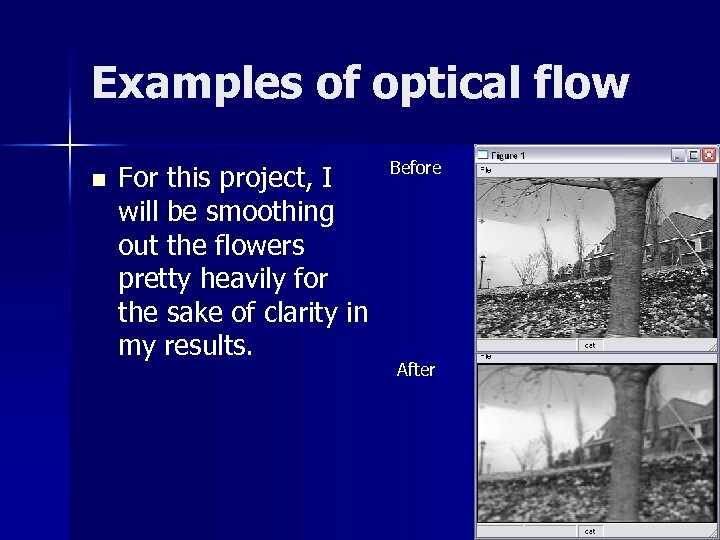 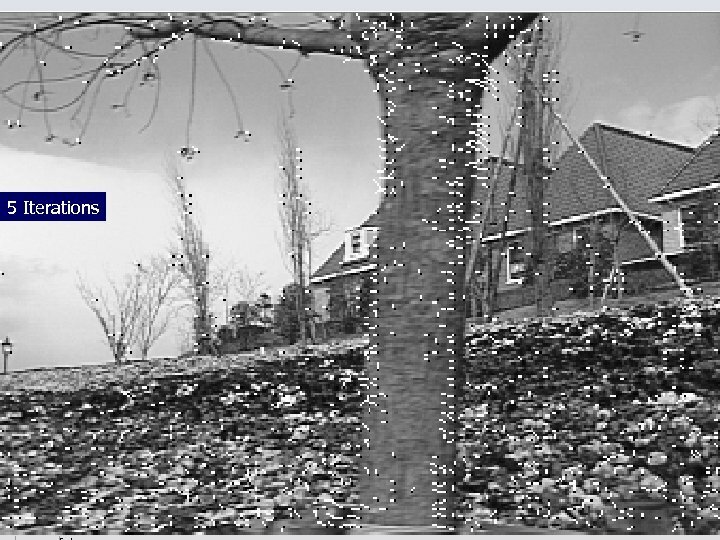 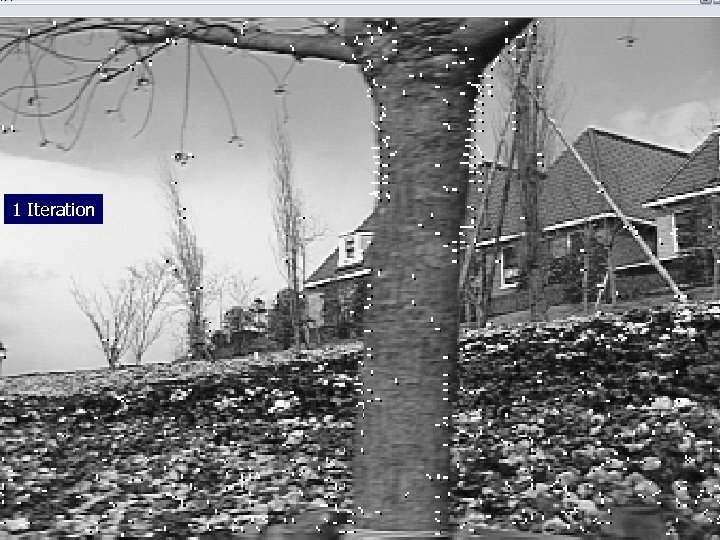 Examples of optical flow n There is essentially one major flow object in this video (the tree), with other minor flow objects in the background (the flowers, house, and small trees). 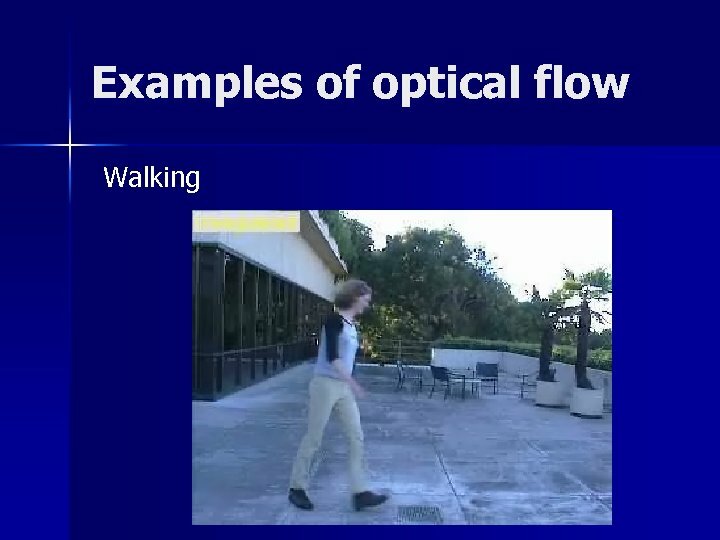 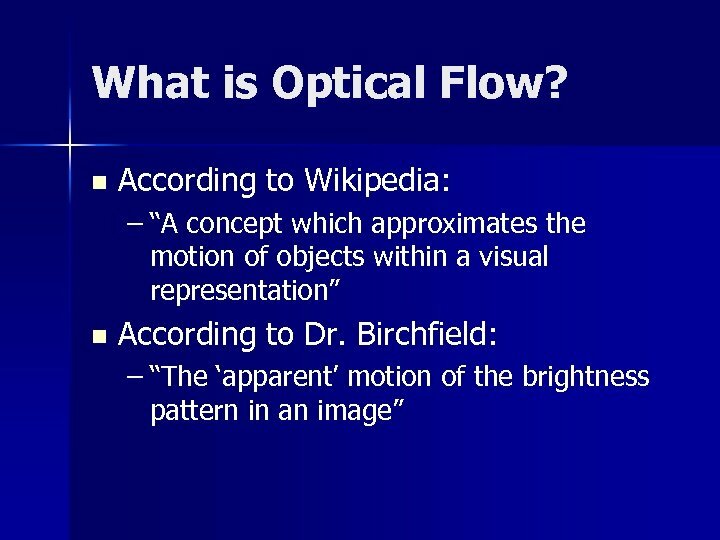 Examples of Image Flow n The only actual flow object is the walker. 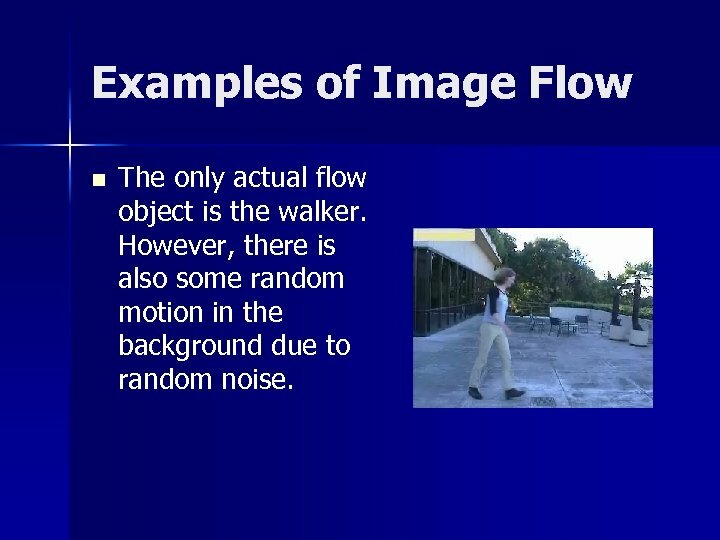 However, there is also some random motion in the background due to random noise. 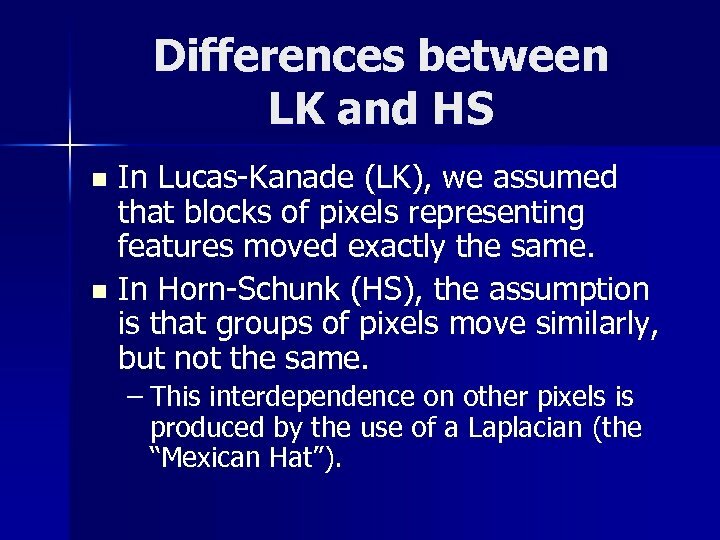 Differences between LK and HS In Lucas-Kanade (LK), we assumed that blocks of pixels representing features moved exactly the same. 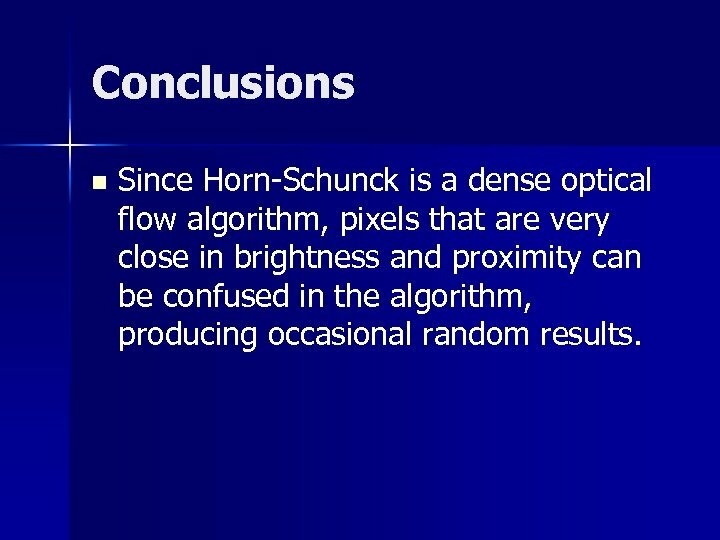 n In Horn-Schunk (HS), the assumption is that groups of pixels move similarly, but not the same. 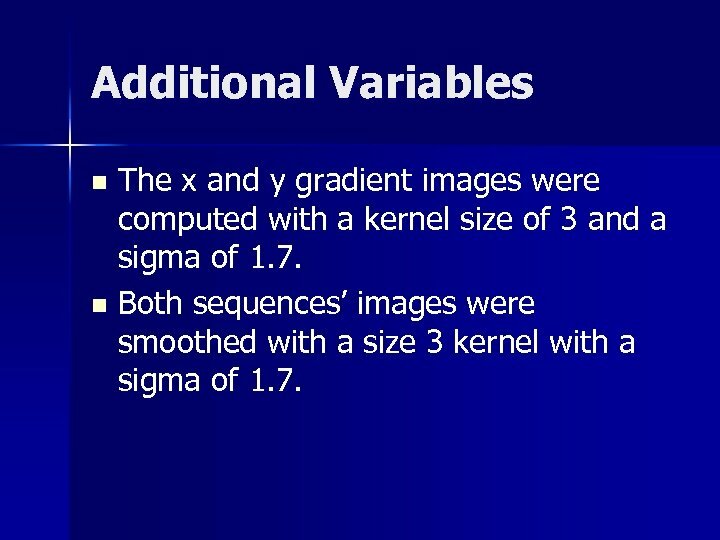 n – This interdependence on other pixels is produced by the use of a Laplacian (the “Mexican Hat”). 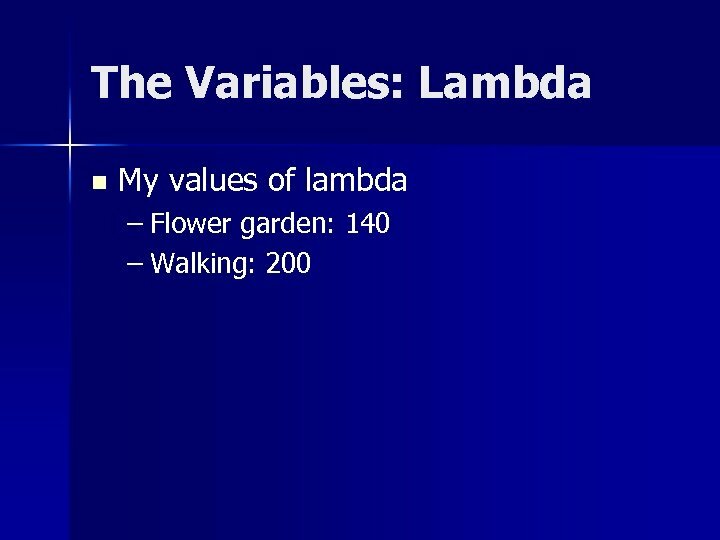 The Variables: Lambda n Value of lambda – Lambda affects the weight of the gradient in the calculation of the motion vector. 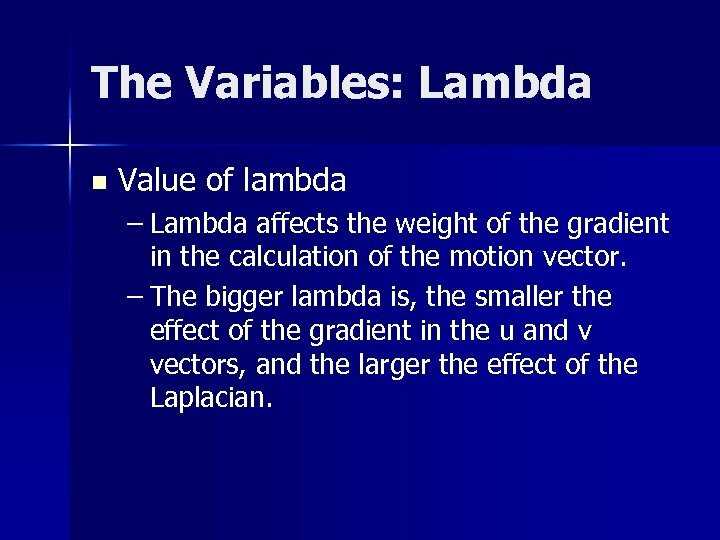 – The bigger lambda is, the smaller the effect of the gradient in the u and v vectors, and the larger the effect of the Laplacian. 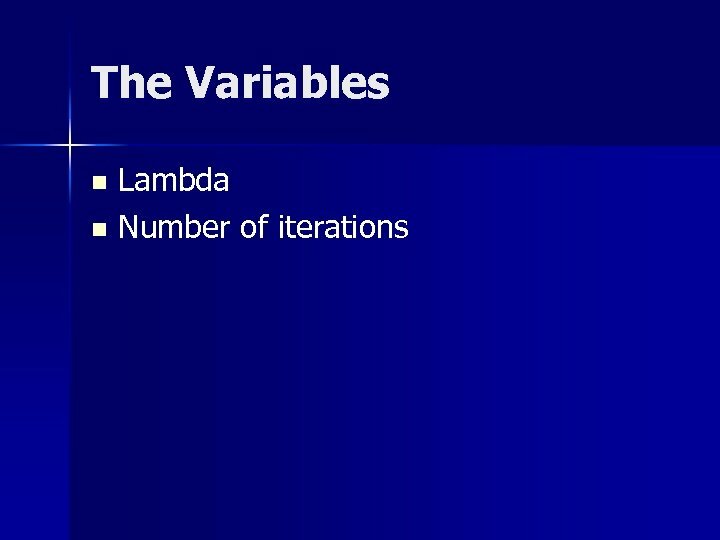 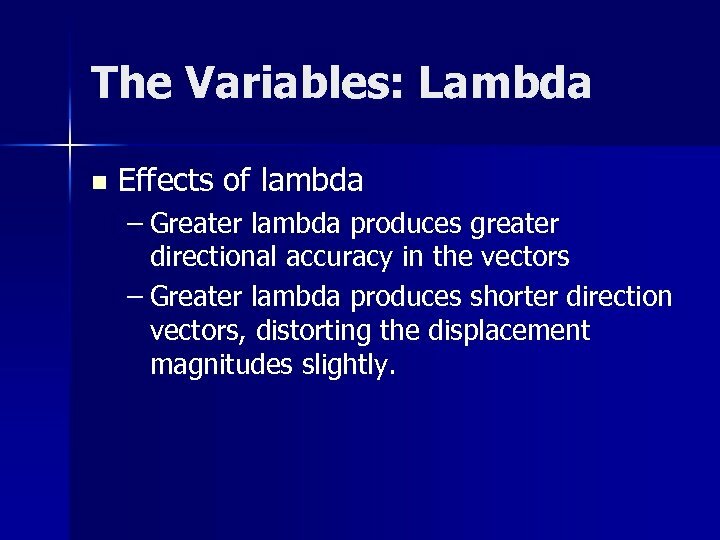 The Variables: Lambda n Effects of lambda – Greater lambda produces greater directional accuracy in the vectors – Greater lambda produces shorter direction vectors, distorting the displacement magnitudes slightly. 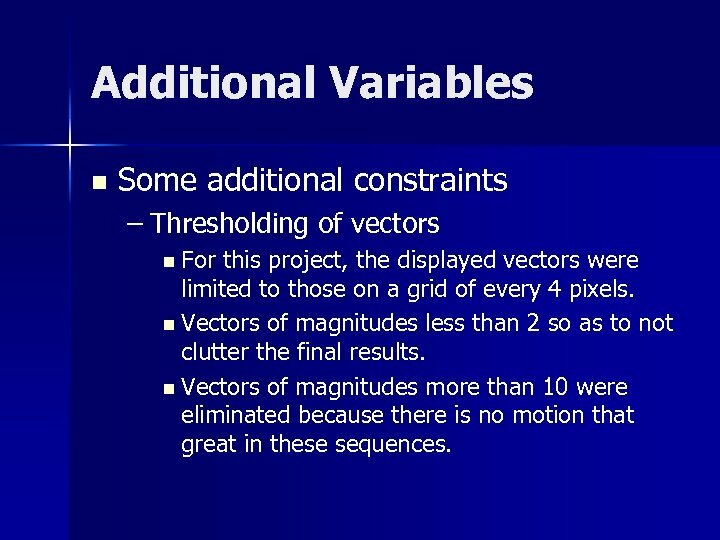 Additional Variables n Some additional constraints – Thresholding of vectors n For this project, the displayed vectors were limited to those on a grid of every 4 pixels. 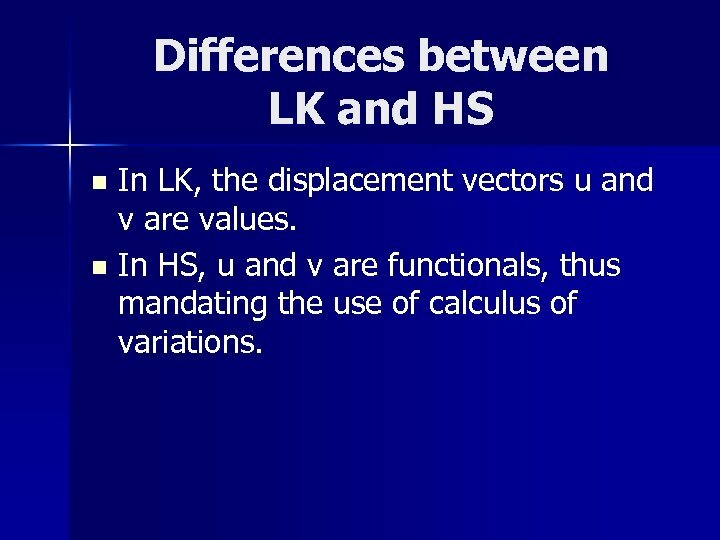 n Vectors of magnitudes less than 2 so as to not clutter the final results. 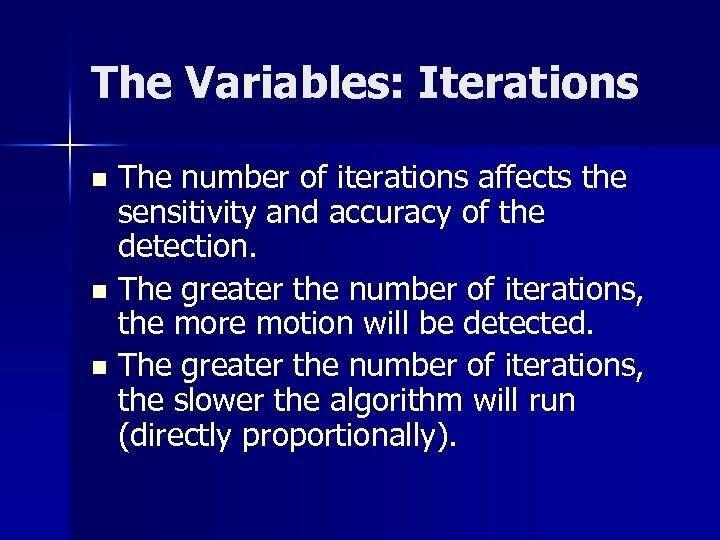 n Vectors of magnitudes more than 10 were eliminated because there is no motion that great in these sequences. 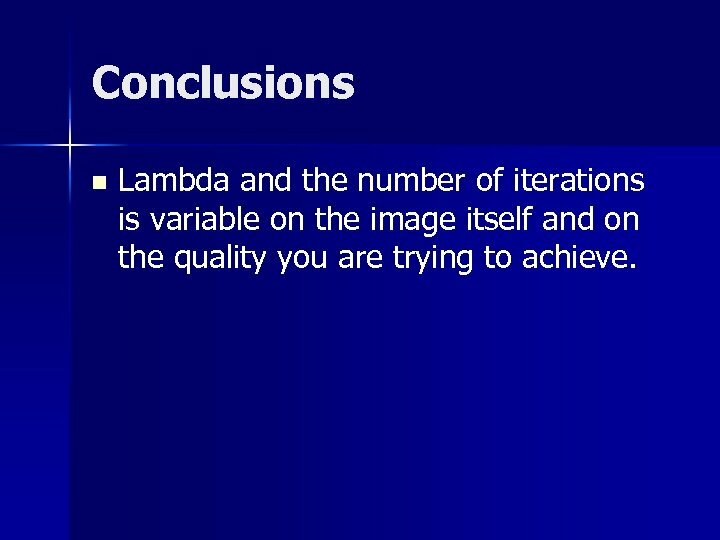 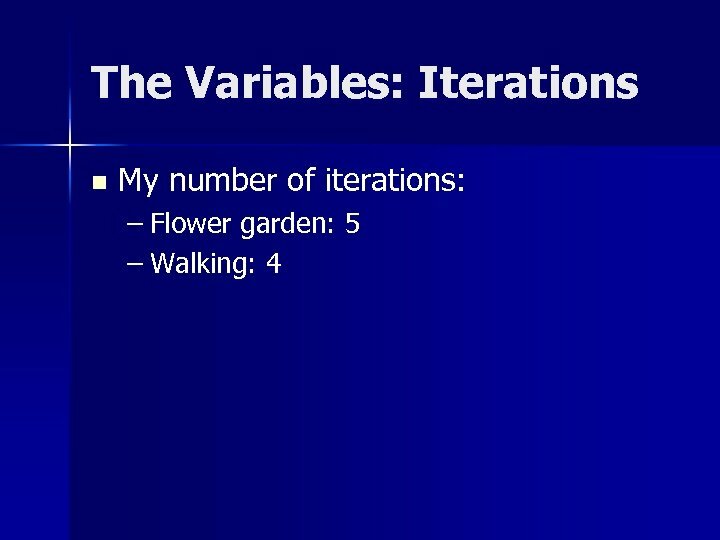 Conclusions n Lambda and the number of iterations is variable on the image itself and on the quality you are trying to achieve. 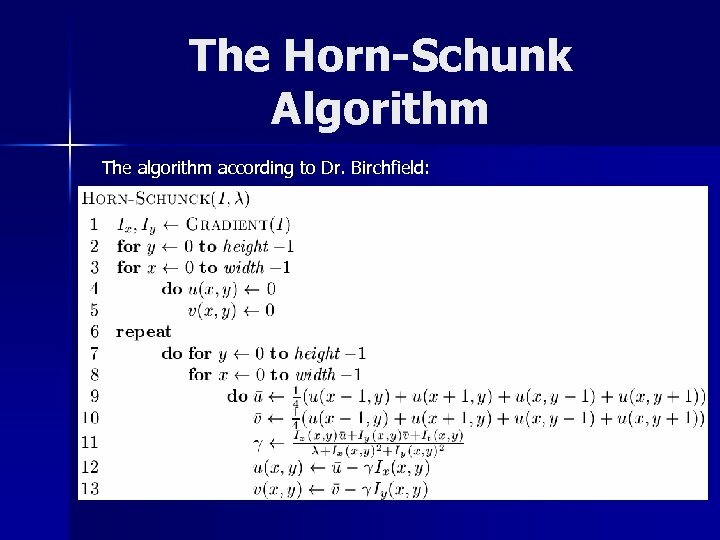 Conclusions n Since Horn-Schunck is a dense optical flow algorithm, pixels that are very close in brightness and proximity can be confused in the algorithm, producing occasional random results. 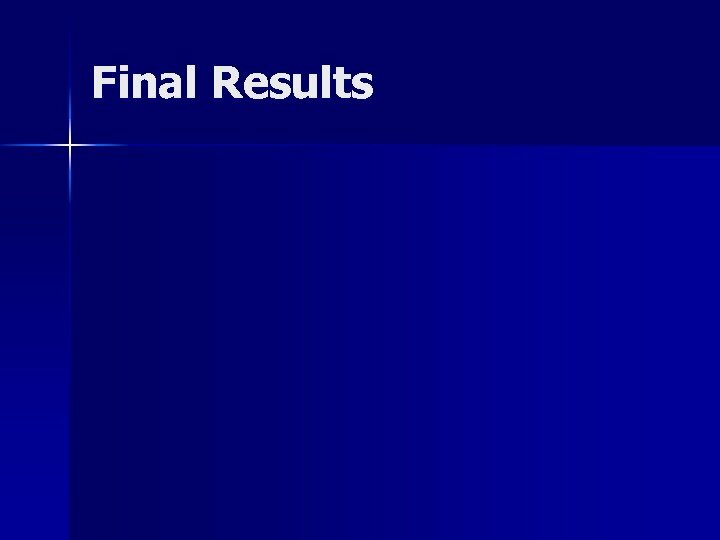 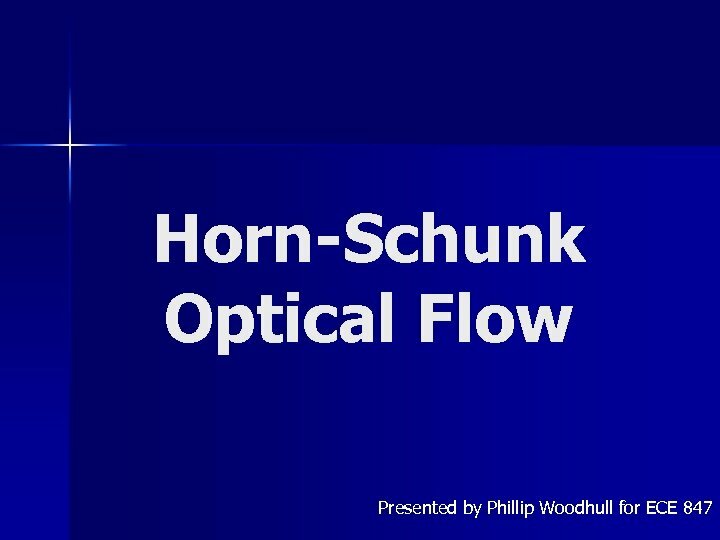 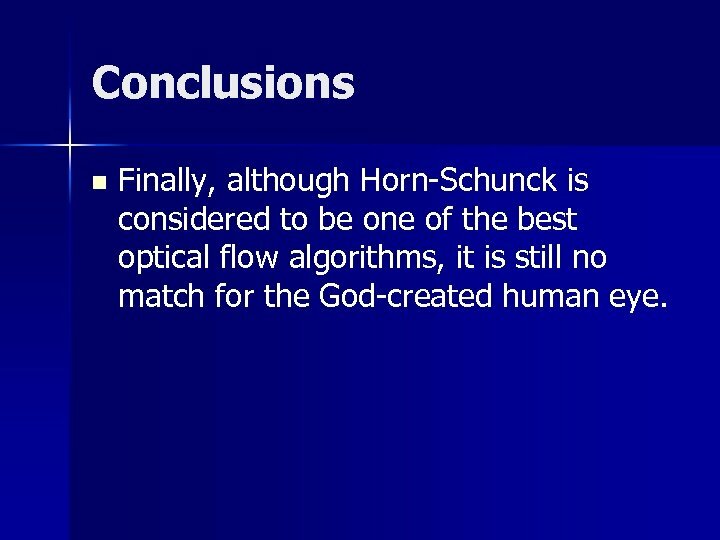 Conclusions n Finally, although Horn-Schunck is considered to be one of the best optical flow algorithms, it is still no match for the God-created human eye.